The BEST healthy breakfast bar! 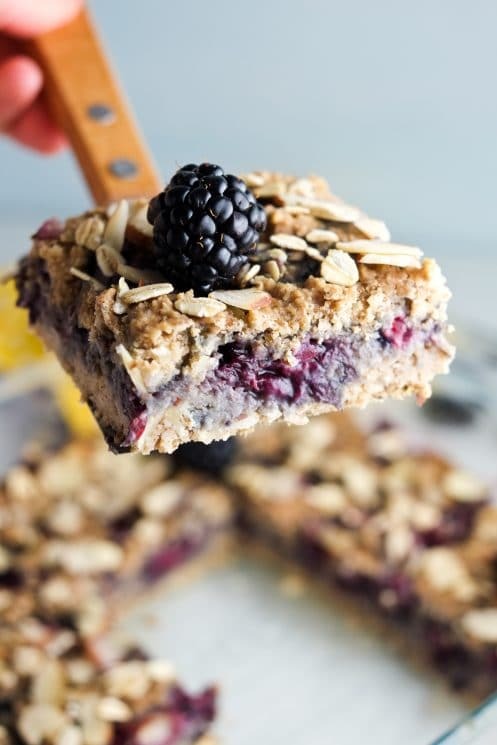 These make-ahead breakfast bars are not only delicious, they’re really healthy and filling! 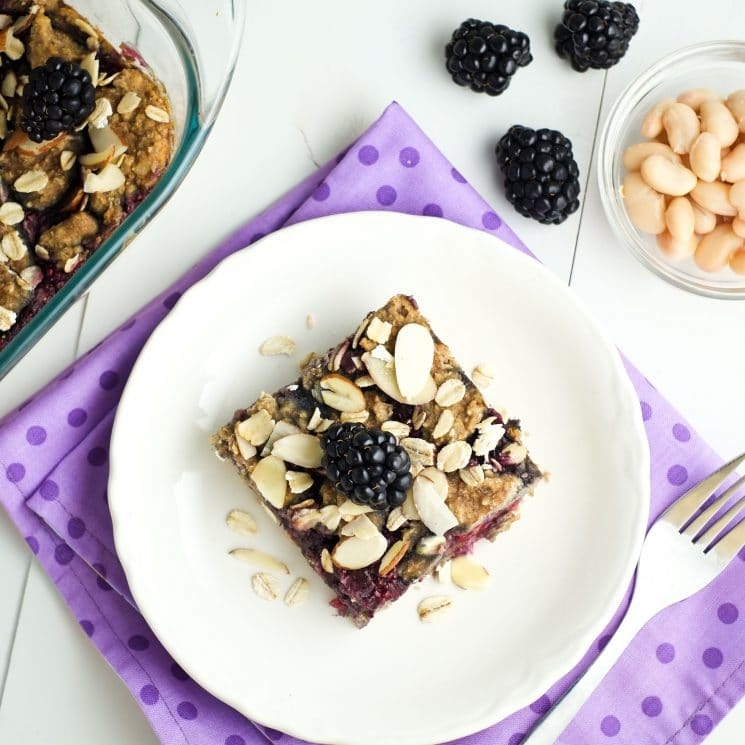 Whip these blackberry and bean breakfast bars up in your blender for a winning family breakfast. I love everything about this recipe. 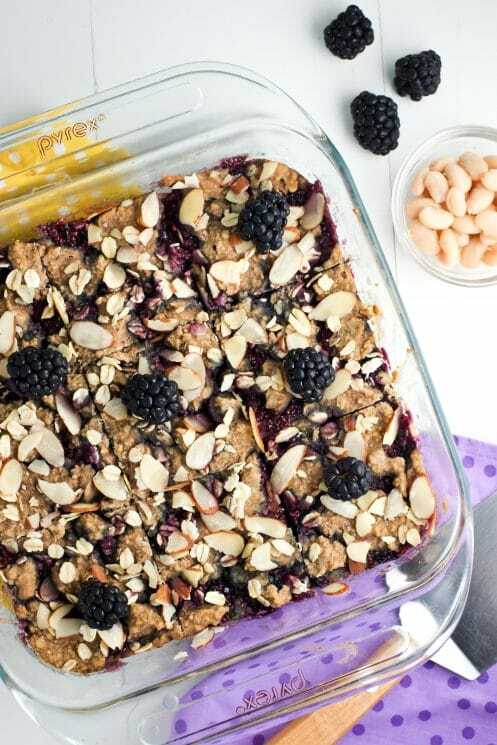 I also love that all its descriptors start with “B”: blackberry and bean breakfast bars made in a BLENDER and then baked. Bam! 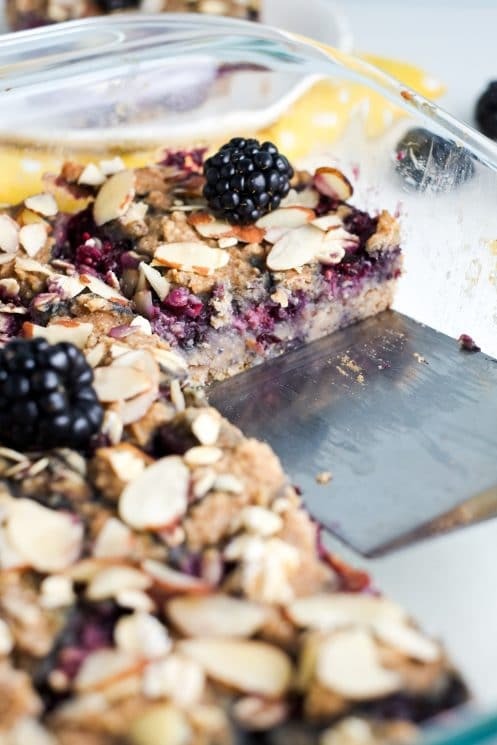 These breakfast bars are definitely becoming a regular around here. Why? I grew up in the Pacific Northwest, where blackberries are plentiful. You just stop your car and pick them by the side of the road. Oh how I love blackberries! Though blackberries steal the show, beans are behind the scenes doing some seriously great work. I have become convinced that you can add beans to almost anything for a boost of nutrition and extra moisture. They hide so well! My inspiration for adding beans came from one of my favorite treats: black bean brownies. If beans could be added to brownies to make them moist and delicious, why not these bars? What’s the result? A cinnamon-y breakfast bar base that is to die for! With no raw eggs, I may have even tasted the batter… and it was amazing! Beans are an amazing source of protein and fiber for satiety and heart healthy. They also help balance this meal out by adding some vegetable protein. Plus, they make the bars extra dreamy. They’re anything but dry and oh-so-filling. And you can’t even tell they’re there — promise! These bars will give you and your family a great start to your day! 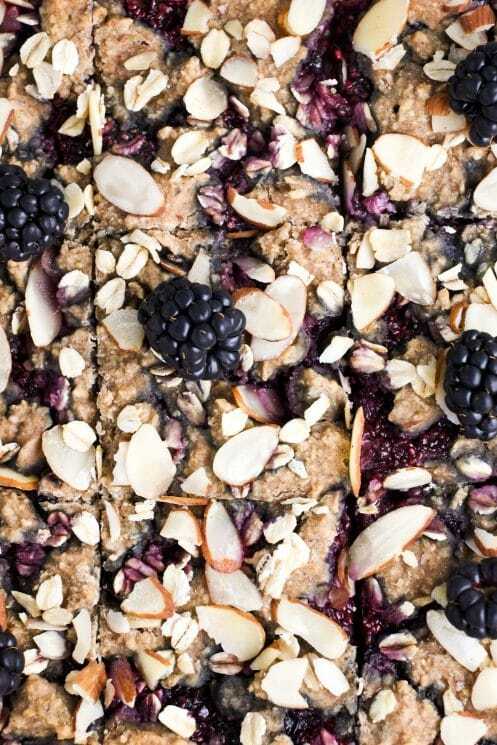 What makes these breakfast bars healthy? 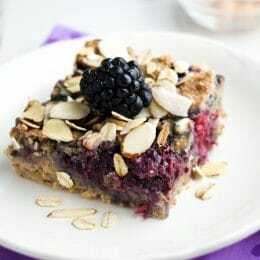 High in fiber: beans, blackberries, oats, and chia seeds so you stay full and regular. Lots of protein and iron for slow-burning energy and alertness. 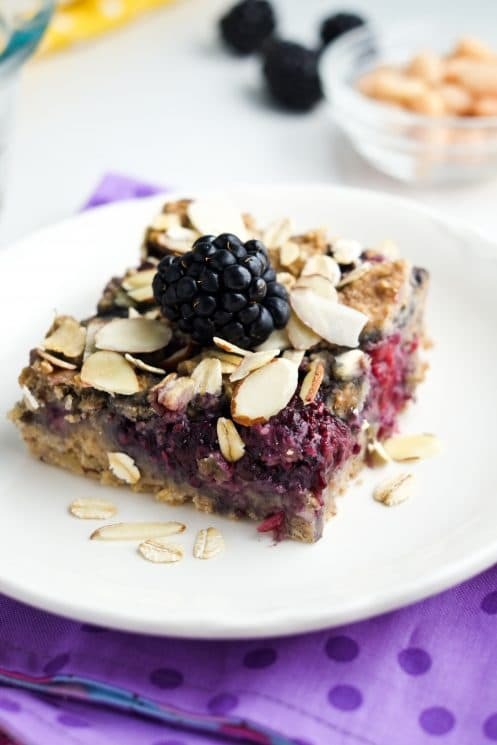 A little maple syrup, applesauce, and blackberries for a healthier sweetness. Plus, blackberries have lots of vitamin C for growth and healing. With so many healthful ingredients, you really can’t go wrong! 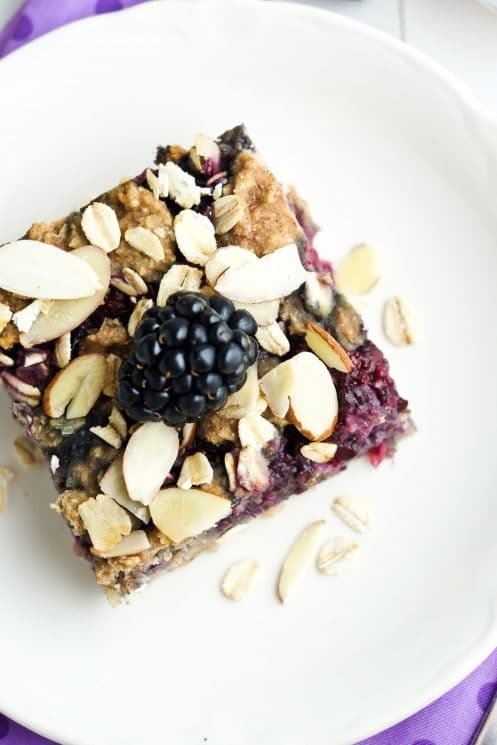 And trust me, these breakfast bars taste amazing – your kids will gobble them up with no clue that they’re eating something so healthy! First, you need to prepare a blackberry “jam.” Don’t worry, no stove-top slaving required. We’re making a no-cook chia jam. 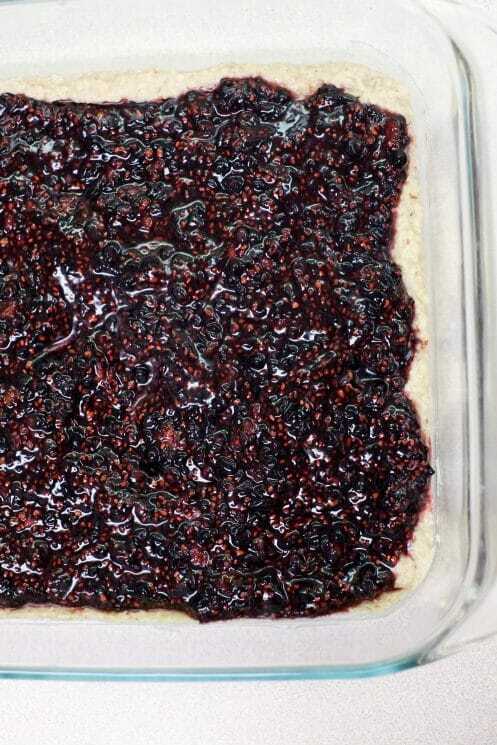 Simply mash 1 6-oz container of blackberries with a fork and stir in 1 tablespoon of chia seeds and 1 tablespoon of maple syrup. I recommend using a high-rimmed bowl because the blackberries tend to squirt (and stain!). Set this mixture aside to congeal a bit. Now preheat your oven to 325* F and grease an 8×8 inch baking dish. I used coconut oil but you could use spray or butter. 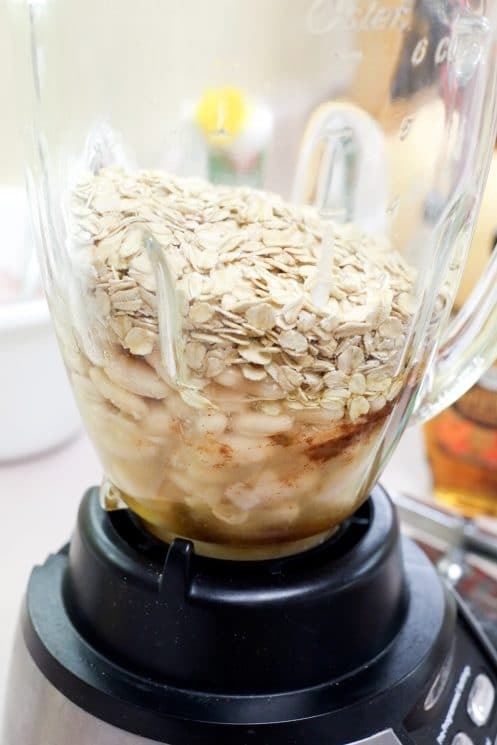 Next, pour in 1/2 cup applesauce, 1/4 cup melted coconut oil (or butter), 2 tablespoons maple syrup (or honey), 1 cup rolled oats, 1 teaspoon of cinnamon, 1 teaspoon baking soda, and 1/4 teaspoon salt into a blender or food processor. Rinse and drain a can of cannellini beans or great northern beans, then throw those into the blender as well. If you’re measuring home cooked beans, you need about 1 1/3 cup of beans. Blend this mixture until it’s smooth. If your blender has a hard time (like mine), then scrape the sides. If you’re really desperate, you can add a tiny bit of applesauce or water to help it along. Now add 1/2 cup of slivered almonds. You can either mix these in for a bit more texture or blend them up – or anything in between. Pour 2/3 of this blender mixture into your greased 8×8 pan. You’ll want about a cup of mixture set aside to put on top later. Smooth the mixture out with a spatula. Next, grab the jam and carefully pour it over the smoothed mixture. Try to spread it evenly, but it doesn’t need to be perfect. Finally, drop teaspoonfuls of the remaining blender mixture evenly across the top of the blackberry jam. The mixture won’t perfectly cover the jam, it’s meant to be more of a crumble on top. If desired, sprinkle a few pinches of slivered almonds and/or oats on top to make it pretty. Bake for 30 minutes at 325* F. The blackberry mixture toward the middle will still look a little wet, but that’s okay. Now cool the bars on the counter for at least an hour before cutting so they have time to set. Ideally, refrigerate these overnight for really solidified bars. This is definitely my family’s new favorite make-ahead breakfast. It’s simple enough for everyday, but scrumptious enough for a special morning too. 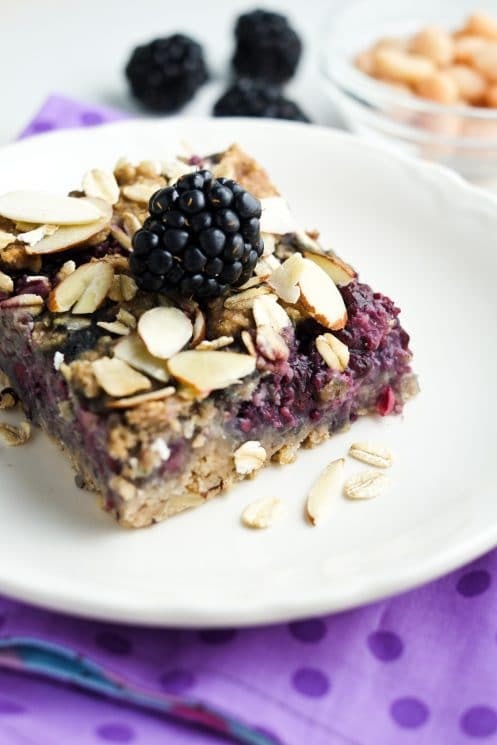 We hope you love these healthy breakfast bars! 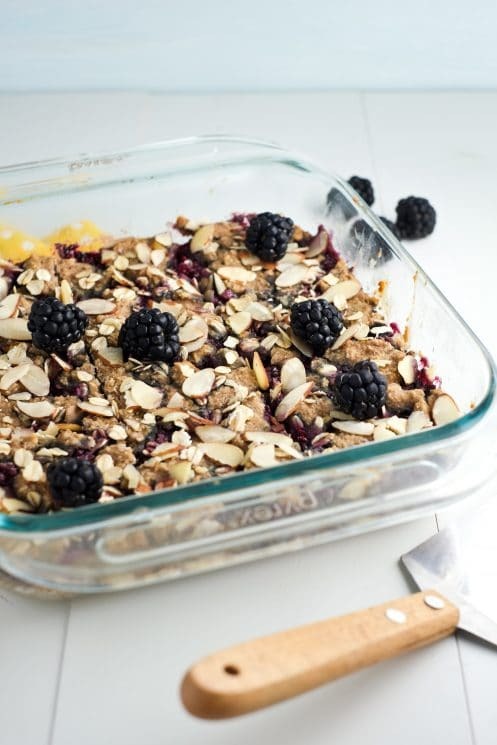 What’s your favorite healthy make-ahead breakfast? Drop small spoonfuls of the set aside bean batter on top, covering evenly. Not all the blackberry jam will be covered and that’s okay. Optional: sprinkle extra almonds or oats on top for texture. Bake for 30 minutes at 325* F. Allow to cool to room temperature and then refrigerate overnight. Cut into nine squares and serve cold. My kids aren’t HUGE fans of blackberries would this recipe work with another type of berries like strawberries or blueberries? I haven’t tried it with any other berry, but I imagine it would work. Strawberries maybe? Let us know if you try it! Can you leave out the chia seeds or use something else in its place? Hi Emily, I haven’t tried it without chia seeds, but I think you could replace them with flax meal. Or you could boil the blackberries on the stove with the maple syrup and some gelatin for a bit to help it congeal. Basically, you just don’t want the blackberry “jam” to be too wet and make the bars soggy. If you double the amount what’s the cook time? Good question – I haven’t doubled it so I can’t be sure, but I would assume it would take longer (and you’d cook it in a 9×13? so the thickness would change). Check it after 30 minutes, and if it doesn’t seem done yet add 5 more minutes as many times as needed I would think around 40 minutes. Wow these are great, I did them with cashews and added back a hemp protein power and a touch of water to help blend better. Awesome. These are fabulous, with just the right amount of sweetness. This recipe is a keeper. I wouldn’t change anything. Wondering if a person could sub in but butter for the oil? Or possibly cut down the oil/butter a bit? Hi there, could you replace the blackberries with blueberries?